We’re big fans of the outdoor markets in Southeast Asia, so when the annual Vancouver Summer Night Market opened its doors in 2008 we put it on our list of things to do in Vancouver. After 3 years of putting it off, we finally made it out to the increasingly popular market last weekend. 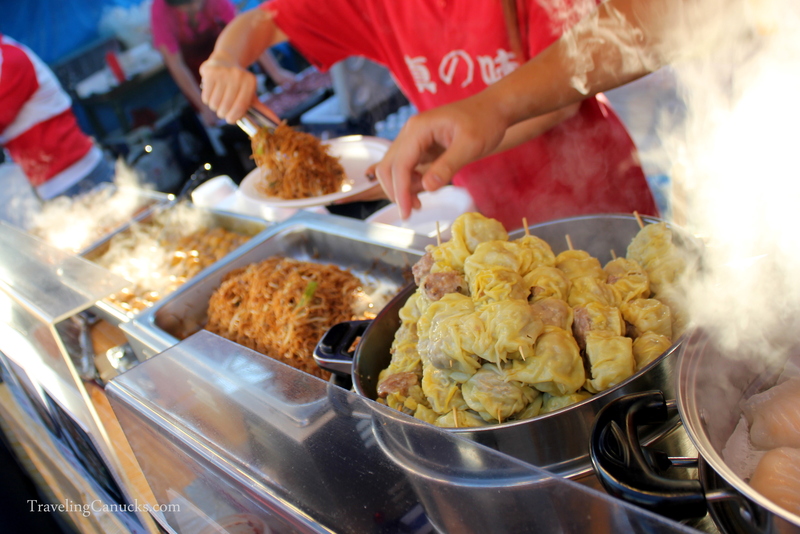 Although the open-aired Asian-style market hosts several vendors that sell a variety of inexpensive items, the real draw to the market is its diversity of mouth-watering Asian cuisine. We arrived at the market just as its doors opened to the public, which turned out to be a wise decision because parking quickly became a nightmare. We brushed past the tacky souvenirs and mobile phone accessories and headed straight for the market’s star attraction – the food! Dozens of welcoming merchants shouted out their daily offerings as we sized up their enticing menus. Clouds of smoke spit out from the makeshift kitchens as the assortment of freshly prepared meat skewers sizzled on the open grills. The Potato Hurricane, a unique take on the deep-fried potato. Now that’s a lot of grilled octopus! Deep fried cheesecake and chocolate bars – now is that really necessary?! The Vancouver Summer Night Market is a great place to spend a few hours on a summer evening. We liked that there is no entrance fee or tickets required, which also makes it a good last minute option for those nights that you’re looking for something to do. Bring money. Although most of the food is priced between $3-$7, if you’re like us you will probably want to try several items. 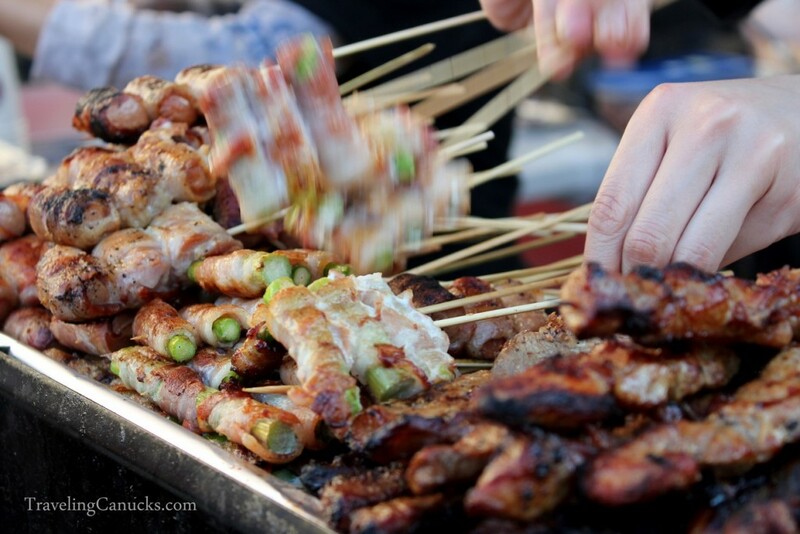 One can easily burn through $20 on the meat skewers alone! The Best Road Trip from Vancouver for first time visitors Winter fun at Sea to Sky Gondola in Squamish, British Columbia That time we took a ride on the Polar Express to the North Pole! Lisbon totally exceeded our expectations! Here’s what we did. Your pictures are great! I don’t think deep fried cheese cake is necessary but why not give it a try! It’s taken us a while to make it to the market as well, but we are glad we did. It will be a yearly ritual. 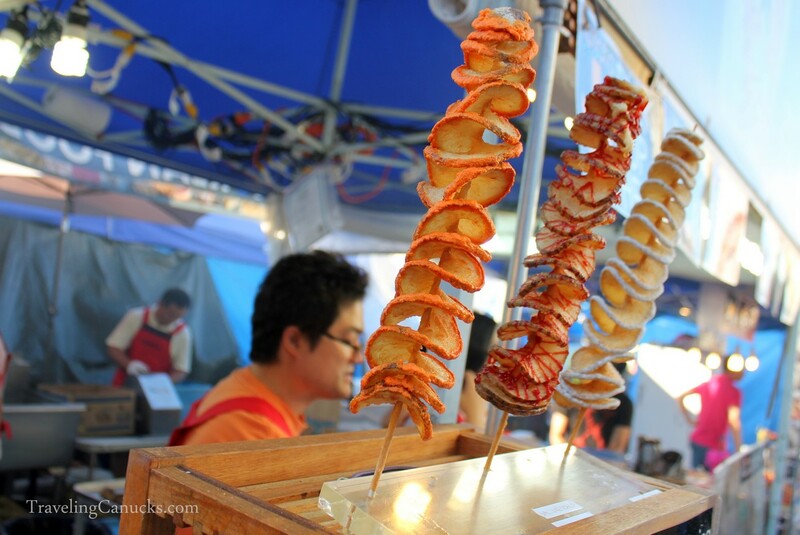 Why don’t the Asian-inspired night markets here (you know, in ASIA) have deep fried cheesecakes? Someone seriously dropped the ball on that one. Oh darn, now I am not just hungry but STARVING. Looks fantastic! Agreed, too much food to choose from. Definitely check it out when your in Vancouver. The most unusual food, but very popular! That looks soooo yummy! I just ate something, but could just start right away again! 🙂 Yummy foodie post! Seriously though, I wouldn’t miss this food market if I was in Vancouver … Unfortunately, I’m not. Thanks for the great photos! Haha, hope the sandwich was good! My mouth is watering! Thanks so much for sharing – You take great photos! Amazing photos! Better being there though!! Agreed. Can’t beat being able to actually try all the food. We didn’t hear about it until last year. Maybe your city does? It’s fairly new here in Vancouver. Excellent food shots of some tasty, but not-so-photogenic, foods! Guys, the food looks so great! Especially the grilled octopus and the yakitori. I’m hoping we have something like this in California. Another great reason we love BC. They are always coming up with new ideas. I have never heard of the place – looks like fun. Some great food shots – and I’ll pass on any mystery meats. Great food shots! Looks delicious. WOW! How on earth did you decide what to eat? It all looks so good. Potato hurricanes are the bomb! Such a Korean festival mainstay. Went there for the first time this year and loved it! Tried a few food items and enjoyed everything. Grilled squid was my favourite — delish! Lots of different kinds of food! Ooh, how I wanted to visit the Summer Night Market! Looks amazing! Great post except for one thing. 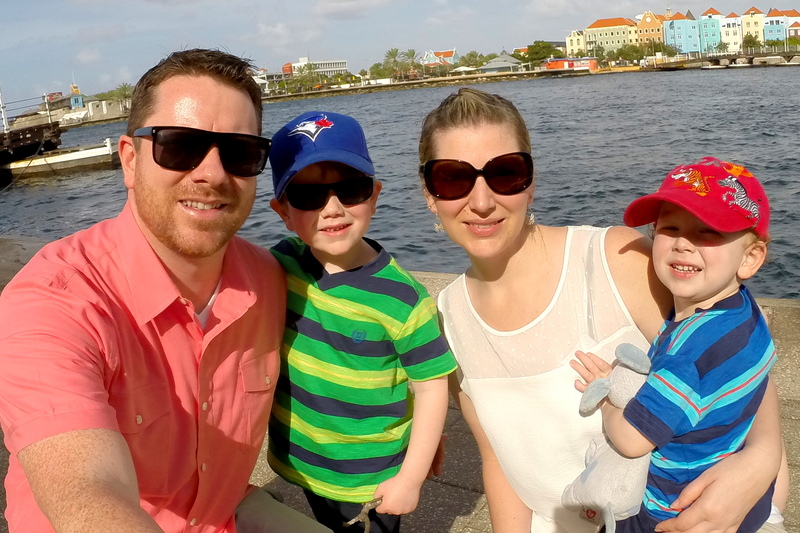 My family and I are enjoying a long-term trip through Europe right now, and you’ve just given a massive craving for about ten different Asian foods that I won’t be able to get until we return to Vancouver in 2012! this looks like the event for me. 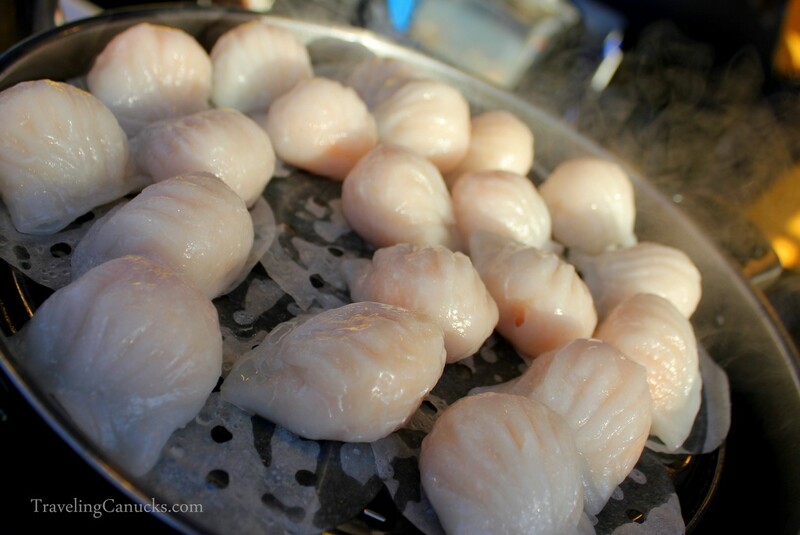 i love asian food and would go nuts eating as much dimsum as possible.all the pictures you took made me really hungry. Deep fried cheesecake can definitely be necessary. What isn’t necessary is probably deep fried butter. Yes, deep fried butter was revealed this summer at a state fair in Iowa. Wonder why we’re fat. Food looks great lot of variety there, the long potato hurricanes have recently taken off here in Cebu, Philippines. Do they cover them in flavoured powder there?